National Nutrition & Obesity Week takes place from 9 to 19 October 2018 and the theme is ‘Breakfast – the best way to start your day’. This is a joint initiative by the Department of Health, the Association for Dietetics in South Africa (ADSA), the Nutrition Society of South Africa (NSSA), the Consumer Goods Council of South Africa (CGCSA), the Heart and Stroke Foundation South Africa (HSFSA), the Consumer Education Project of Milk SA (CEP), the Cancer Association of South Africa (CANSA), Department of Basic Education (DEP) and SA Military Health Service (SAMHS). This year National Nutrition Week aims to inspire South Africans to eat breakfast every day. The importance of breakfast has long been a part of the prevailing wisdom, and the habit of eating breakfast has always been a marker of a healthy lifestyle. Yet, if there’s a meal that is going to be skipped, it’s probably breakfast. Why? Eating a healthy breakfast regularly influences brainpower and physical energy on a day-to-day basis. It also affects health over the longer term as studies have drawn associations with reducing risks of heart disease and strokes, high blood pressure and Type 2 diabetes. Skipping breakfast also doesn’t equal weight loss. In fact, there is research that shows that not eating breakfast can lead to weight gain as breakfast-skippers are more likely to consume easily accessible but unhealthy snacks to get themselves through to lunchtime. They may also forget about portion size when it comes to lunch just because they are so hungry. Morning rush, no time – Of course, our mornings are more urgent than our evenings. It is harder to relax and enjoy a meal when you’re anticipating everything that needs to be done in the day ahead and you have time pressures. However, it just takes a bit of planning and preparation to fit breakfast in. It helps to do as much breakfast preparation as you can the night before. Before you go to bed, set up your kitchen for breakfast. Soak the oats and slice the fruit so you don’t have to do it in the morning. Cook extra maize meal porridge for the next day’s breakfast when making supper, or boil some eggs the night before. Planning can make breakfast quick and easy. I don’t like typical breakfast foods – Most people do find something they like amongst the range of foods we generally eat for breakfast, but it is important to remember there are no hard and fast rules. It doesn’t matter whether you eat the same things as others for breakfast – it just matters that you have a healthy start to the day. This means having a minimally processed starchy food, fruit or vegetable and combining it with at least one other food group. For example, maize meal porridge with maas, brown bread with pilchards, fruit and unsweetened low-fat yoghurt. Last night’s leftover beans can be used as a sandwich filling on brown bread for a great breakfast. There are a lot of expensive foods presented to us as ideal for breakfast, that are not healthy – there are breakfast cereals and cereal bars and biscuits, jams and spreads stacked with sugar that we should avoid. It takes my system a while to wake up, I don’t feel like eating in the early morning – Although breakfast is ‘breaking the fast’ between our longest sleep and lunch, there are many people who question the advice to eat when they don’t feel hunger. What’s important to consider is that breakfast can take place within 3 hours after waking. You do not have to sit down to a big bowl of porridge at 5:30am to have had breakfast. You can stagger your healthy breakfast over a three-hour period after waking as long as you are not considering a chocolate bar or a packet of crisps as ‘breakfast’. You could start with an unsweetened, low-fat yoghurt at 6am just before you leave home; have a banana en-route to work around 7am and eat a peanut butter sandwich on brown bread at 7:45am before you start work. Breakfast is easiest to ignore and I’m skipping meals to lose weight – It is important for those who are overweight and obese to follow a sensible, results-driven weight loss programme guided by registered dietitians and nutritionists. There are an abundance of studies that show that children, adolescents and adults who eat breakfast have better weight outcomes and lower risk of overweight and obesity. Skipping breakfast can lead to unhealthy but convenient food choices as one tries, on the fly, to get through to lunchtime. These foods are often laden with free sugars, fat and salt. It can also lead to blowing out lunch and dinner portions to compensate for the lack of breakfast. What about children and breakfast? – This is a very important question. As parents and caregivers, we are role models for the healthy lifestyles we hope our children will adopt for their lifetimes. Studies have shown that children who eat breakfast perform better at school than those who skip it. Eating breakfast has an immediate, positive impact on cognitive function, especially memory and concentration. 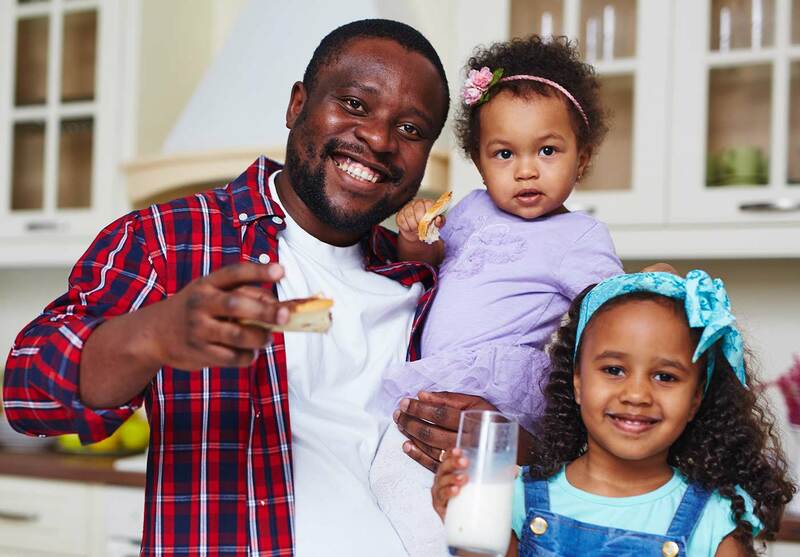 Parents are the major influence on whether children make eating breakfast a habit, and studies have shown that 1 in 5 of South African children skip breakfast. It helps to make breakfast a family activity and involve children in preparing breakfast and eating together. Parents also need to ensure that healthy breakfast options that their children like to eat are available in the house. Eating breakfast regularly has many health benefits. Planning for breakfast, from drawing up meal plans and a food budget to shopping for affordable, healthy options and preparing the night before, can help to avoid breakfast becoming a hassle. When you make breakfast an important and enjoyable part of your family routine, you model healthy lifestyle choices and behaviour that not just benefits your children through their school and study years, but can become a healthy habit for their lifetimes.